Unique experience, artist residence in a fantastic Brussel’s gallery: 2BR, 2 bathrooms, split level 110m2. In the heart of the trendy district: Chatelain, Flagey, Louise. Tram, metro, Lacambre Forest within min. This excellent split level Gallery Residence sits above the beautiful Atelier Relief studios. As you enter the building you’ll experience the wonderful artworks that this gallery offers its international client base. The bright airy residence, located on the 3rd floor, provides a unique residence experience while enjoying the business and leisure districts of this excellent capital city. The residence was fully refurbished in 2015 as part of the development of the Atelier Relief studios. The residence is designed with the artist in mind as they often use this facility while working in Brussels. So book quickly as demand can often be extraordinary. •	Coffee table, books cases and candles for that relaxing evening. •	All cookware necessary to make gourmet meals. •	Radiators in all rooms. •	International plug adaptors x 2. The apartment also provides many essential items to ensure you have a hassle free start to your stay. Do remember this is a self-catering apartment. Items provided may require replenishment by you but only if the run out. The dimensions are, inside – 1,050sq feet (110sq mtrs). The residence is maintained by our Housekeeper extraordinaire, who prepares it immediately after the guests check out. Therefore, the residency is available 24/7. We use a ‘safe key & security code’ exchange system for exchanging the keys & codes, which means you have no hassle access and a very secure stay. I’m are available 24/7 if you have any urgent needs, which you must address immediately. I provide full mobile, email an IM contact details once you have booked the residence. I’m always looking forward to hosting great people. Want to find out more about what’s on offer? Email me. I provide guests with ‘Andrew’s local guide to Ixelles 2 weeks before they arrive. This explains how to reach the residency by planes, trains and automobiles as well as many local places you can visit, eat, drink or go to during your visit. The Gallery Residence is located on Rue Vilain XIIII, 20 – 1050, on the second (3rd) floor. Access is through the front door from the road into the main building and then by stairs past the Gallery to the residence. There is three step from street level to the main front door, which leads you towards stairs and onwards to the residence. Access will be limiting to those with mobility issues. Once inside access to all room is on split level, so it is straightforward for people with to move around. Access to the residence is obtained through a set of keys and alarm security code. I’ll provide full details on key & code exchange once the booking is made. It is very, very simple. Details for these are provided in a one-page PDF document, which you can bring with you for ease in electronic or paper format. My approach is providing you, the guest, with the freedom you require to fully enjoy your stay at the residence. In advance of your arrival I will provide you with a ‘some helpful things’ document that sets out what you need to know about the residence when you arrive. On arrival either my housekeeper extraordinaire or I can meet you at the residence, if requested. If you’d rather the privacy & intimacy to enter the residence on your own we’ll respect your request. Once you’ve checked in why not phone, text or what’s app me if you have any questions. Please do remember that the work studios are below so during the day artistes and likeminded people will be in the building. During your stay I will or you can contact from time to time by text message or phone to ensure all things are well. On the morning of check out I will be available text or what’s app to ensure a successful check out for you. If at any time during your stay you need me to come around to the residence you only need text or phone and I’ll attend straightaway. We can arrange other concierge & PA’s services or events, which can be organised in advance of your stay through Gorgeous Apartments see the world wide web for more details. This residence is not to be used for a party during your stay, please do not book it if this is your requirement. The residence is available for short or long-term letting and ideally suits entrepreneurs, business or visitors on the move, lifestyle travellers, small groups, individuals couples, families with young babies or children on holiday in Bruxelles for a few days, weeks or months. This listing is in demand so it’s worth booking early to save disappointments. The main rules are that people treat the neighbours and the residence with respect. The residence should be left as you found it but if you do break, damage or lose any items please let me know. The residence is located in Ixelles 1050 and it’s within walking distance of many of Bruxelles sights, from the Art Loi, to Avenue Louise, to Flagey and Bruxelles’s luxurious Sablon. The Grand Place, the Place des Palais, the Palais de Justice, Bois de la Cambre and the Bourse de Bruxelles are within 15 minutes travel time (tram & metro) of the residence. There are lots of shops, restaurants and café in Ixelles for you to marvel in. The best grocery stores nearby are DelHaize & Carrefour, (2 minute walk) from the residence front door. Avenue Louise, which is one minute, closest tram stop is Vleurgat. The tram will take to Central Bruxelles leaving you 5 minutes walk from the Gran Place. If you’ve rather take the metro take the tram from Vleurgat to Art Loi, 3 minutes and from here you access the metro (underground). This will take you into the heart of Brussels or the main railway stations should you be onward travelling. For those who enjoy walking there is a fantastic walk, turn right down Avenue Louise over Art Loi, past Palais de Justice and take in the breath taking view of the city across to Anderlecht. Alternatively, turn left on Louise walk for 10 minutes and enter the enchanting Bois de la Cambre and make your way to the Chalet Robinson a 3-story, wood chalet restaurant with cocktail bar and a terrace overlooking lake, for excellent Belgian cuisine. There is an abundance of public transport (bus, cabs, trains & trams) within 1-5 minutes that provides access to local, national & international travels (trains, planes & automobiles), Bruxelles’s many historic and beautiful attractions. 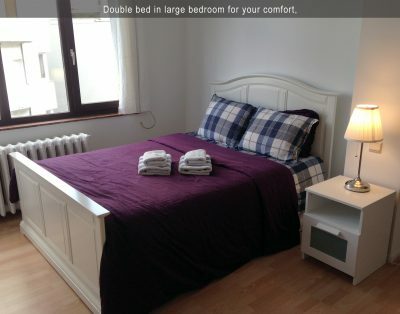 The residence is located on a secluded road in 1050, Bruxelles noise is low and there is plenty of street parking (meter payments) directly outside for those wishing to arrive by and use their car during their stay. There are several bike hire stations within 10 minutes walking distance from the residence for those wishing to have a leisurely cycle around the capital. There are plenty car hire points close to the residence if you need a car while in Bruxelles, google search is your friend. Bruxelles is best served via E19, E40, E411, E420 exit at the ring road. Input 1050 or Rue Vilain XIIII, 20 into the GPS and hey presto. Ixelles is in central Bruxelles so allow plenty of time for potential traffic delays.